I don’t know about you but I love those disgustingly sugary Little Debbie’s Oatmeal Creme Pies. So soft and chewy and sweet and good and terrible. I was craving them yesterday, hard, so I decided to make some. I found some random recipe on the good ol’ interweb, but then I wrote it down and now a simple google search is not leading me to where I got it from. Whatevs google, whatevs. COOKIE VERDICT: They are good. There is no lying. The cookies were soft and lovely and the filling was also tasty, minus my added ramp flavour (see below, ha). There’s always room to improve though! Maybe I’ll make an “upscale” version of these some other day. I sprinkled some strawberry powder onto some of them before sandwiching, and it’s delicious. Quite delicious. For the cookies: Preheat your oven to 350F. Cream the sugars, margarine, molasses and vanilla. Add the eggs one at a time. Dump in all the dry ingredients and mix until combined. I pulsed my oats in a food processor for a few seconds just so they had a finer texture and wouldn’t give the cookies a weird shape with giant oat flakes. Scoop the cookies out to whatever size you want, I used a 1″ cookie scoop and got 12 sandwiches out of it, and lots of extra cookies. Bake them for 8 minutes. They should still be soft. For the filling: Just whip everything together with a mixer, fill a piping bag, pipe on to the cookie halves and sandwich together! Funny story, the shortening I had in my fridge has been there for a while, and it made my filling taste ever so slightly like onions. Or ramps, rather, since they’re just hanging out in my fridge all happy making everything smell and taste like ramps apparently. Good on ya, ramps! Take over that fridge! You could probably use butter in place of the margarine and shortening if you’re one of those people who hate on anything but butter, but I like to make recipes the way they are written the first time I make them, for science. Cause you never know! 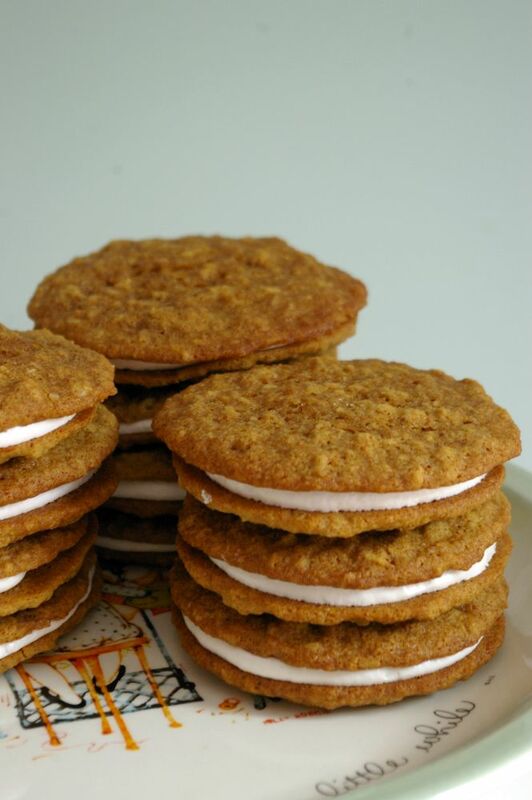 I think it’s funny that a google image search of “oatmeal creme pie” will not result in ONE single actual pie picture. Which did surprise me, cause people do weird things sometimes. However, you will find a picture of a giant gross snake, who’s name is Oatmeal Cream Pie. This entry was posted in Cookies, Delicious things I think are pretty delicious and tagged cookies, oatmeal creme pies, sandwich cookies. Bookmark the permalink. OH MY JESUS THOSE LOOK TREMENDOUS!